The Ab Dolly Plus is an infomercial ab machine, that I have actually seen in health clubs. But, should you invest in one for your home? Ab Machines are all over the television and internet. It's a shame that they all promise model-like looks with little to no effort because the truth is that it takes hard work to get in great shape. Spot reduction is the #1 Ab Exercise Myth, and big companies keep using this myth to sell ab machines. Even though Ab Machines cannot magically get rid of stomach fat and give you 6 pack abs, they can help to strengthen your abdominal muscles. The Dolly is very similar to the Ab wheel and the Ab slide. All of these ab exercise machines can help to strengthen your core. As a personal trainer and physical therapist, I see the value of using these machines to strengthen your muscles, but remember that you cannot spot reduce fat. If you have used the dolly for a workout or own one, share your thoughts about it below. Have you used the Ab Dolly? If you have used the Ab Dolly, tell everybody what you think about it. Whatever thoughts you have about the Ab Dolly Plus share them with others so they can have a better idea of how to spend their money? 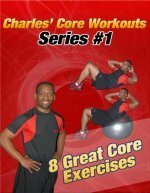 If you don't have access to an dolly but own a stability ball, you can try these exercises that are very similar to ab wheel exercises.